Right now our students are super stressed with finals. Whether they are in high school or college, doesn’t matter, they are maxed out. Now if your middle schooler is anything like mine, he’s just stressed out about having to get up and actually go to school (insert rolling eyes). Looking for ways to help your student? So, what can we do as parents to help our kids as they are preparing for finals? Let’s help them to have the best semester ever! Here are a few ideas… *This post may contain affiliate links. This means , at no additional cost to you, we will earn a small commission if you click the link and make a purchase. Encouragement is helpful, and can go a long way towards your child keeping on with their work. I find that if I nag, then we get into a fight, and that goes nowhere fast. So, the next time your grouchy teen snaps at you, take a deep breath, count to 10 (or 50 or 100), and respond in a non-snappy way. I know, easier said than done, because I am the queen of snapping! Hang in there, deal with the current situation, then go open a nice bottle of red! Ask them for ways you help. Maybe, for now, you could expect less from them around the house so that they aren’t having to deal with as much for the moment. Stock their favorite snacks in the pantry and fridge for easy access. My boys like me to even serve them in their rooms on a tray–I try to get seasonal party plates and cups for cookies, cheese and crackers or any other goodies. This is the only time that I do this, so it’s fun to order things that I wouldn’t normally have in the house. Send quick texts if your kids are away at school at times you know they would be between classes. Send them a card or a pre-made finals care package, healthy and not so healthy, to ease the pain of studying. They LOVE this! Here is a great guest post on our blog about putting together care packages! Make them take a break every now and then. Everyone needs a break. I know one of my boys would never think to take a break, and would get mad if I even suggested it. But, make this happen occasionally, and they might just thank you later. Watch a favorite episode or movie. Bake a batch of cookies together. Run up to their favorite fast food joint together and let them order what they want. Even just giving a quick hug or high five can be all the affirmation that they might need. 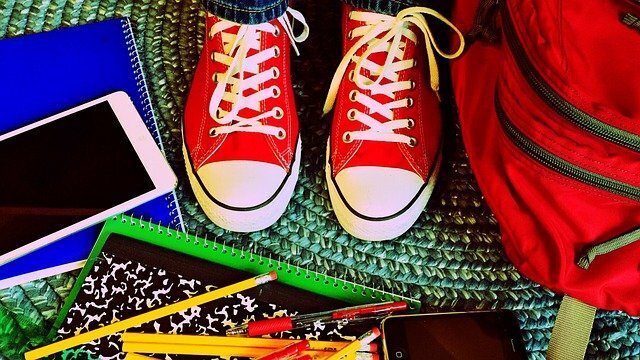 Any of these activities would be great for getting their mind off of school just for a while. Then they can go back to work refreshed. Put it on their bathroom mirror or on their desk with a motivational quote or verse. My boys have often left these for months because they knew I was thinking of them! If your kiddo is away, even out of college and in a stressful period with maybe a first job, you can do something similar. Send them a card with some encouraging words. 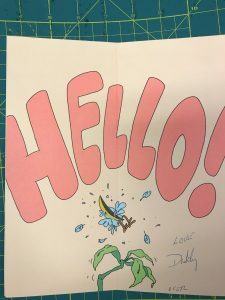 It is always so fun to actually get snail mail, and I bet they keep it! I still have a silly card my dad sent me when I was in college during some stressful period-probably finals. I love the fact that my dad took the time to write it (even though he mentions that my mom told him to!) It meant the world to me! This seems like a no brainer, but a lot of kids skip this meal. I fix breakfast during the week for my boys for that reason alone. If you aren’t in this habit, make the time to until finals are over. Feed their bodies and their brains. Cooking is the way I show my love to my family. I love to cook, and it makes my heart happy to feed everyone. When kids have any kind of test and especially when preparing for finals, this is the most important meal! They will be tired and most likely grouchy during this time. Encourage them to get enough sleep. Make sure they are eating enough of the right things. Let them know you love them. Be patient. This too shall pass. Every finals season, I feel like I’m taking them too because the stress is almost contagious!! Deal with it a minute at a time, then go hide in your room with your latest Netflix binge! Look for more ways to help your student. 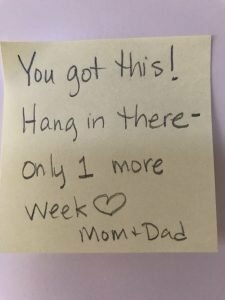 Do you have any strategies that have worked for you as your kids are preparing for finals? Please share! **A great website for ordering care packages is Home Sweet College Home! They offer personalized, unique, affordable, fast and easy packages. They put together any type of package for anyone, but they love to put them together especially for college students. They have pre-made and build-your-own packages. They also have a monthly option which is awesome! Check out Home Sweet College Home. Great post! I love the sticky note idea. Knowing that someone cares is always great motivation. Thanks for sharing! Hey, so glad you liked the idea:) We are still learning this blogging stuff, and I just realized that we had a comment! My boys love their post its! Did you try it? Let me know if you have any other ideas! We always like to try new things out. All such great ideas Melanie! My son was home from college over Fall Break, and he was stressing trying to get some school work done. I was kinda hurt that he wouldn’t take a little time to talk to me that day. And then I remembered…snacks! Took him a little snack up to his room along with a water bottle. He immediately calmed a little and said thanks! Mom win!